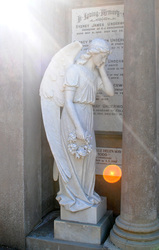 Lens flare can cause effects similar to orbs, and sometimes the two anomalies can be confused. In photography, lens flare is a pest. Most serious photographers use lens hoods (shades) and take additional steps to prevent stray light from entering the camera lends, bouncing around inside and ruining the photo. But most compact cameras and phone cameras have no provision for lens hoods and the photos tend to suffer from extreme lens flare when the sun or other bright light is striking the front of the lens. 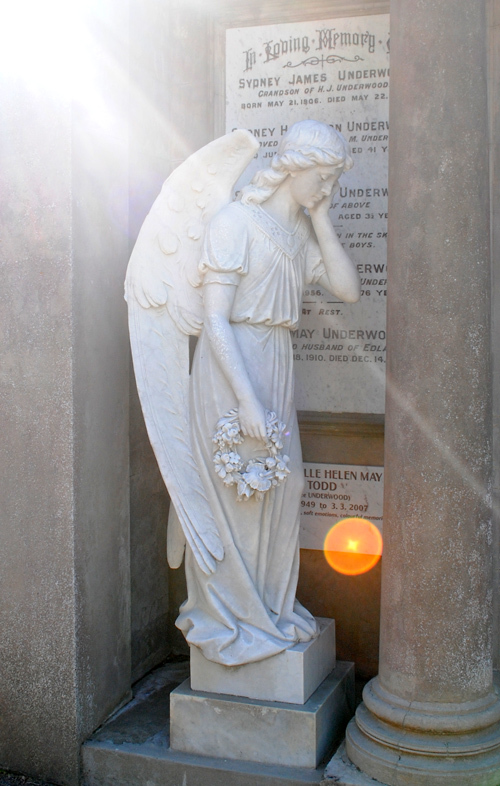 It is quite easy to mistake some examples of lens flare for paranormal phenomena, especially when they occur in places like cemeteries or there is some other significance to the photo, perhaps concerning departed friends or family members. We can't entirely rule out the flare appearing for some reason other than that given above. Also see this blog article on lens flare causing false positives in paranormal photos, by James Gilberd. 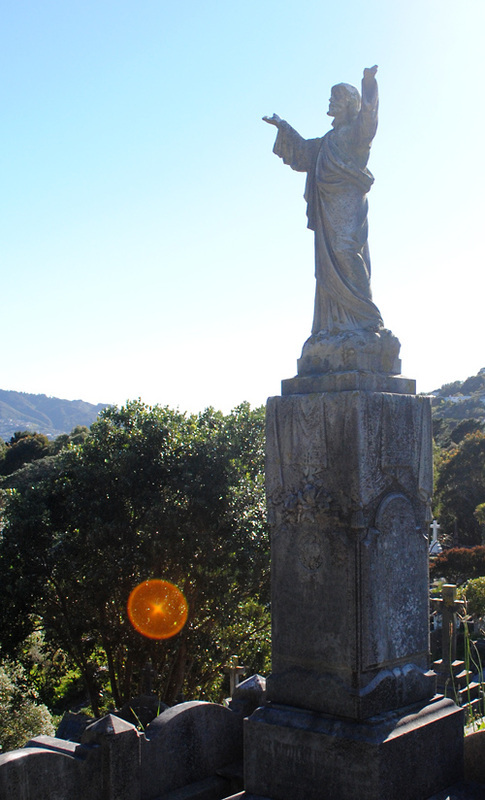 And this one, showing a large green orb resulting from lens flare. - More on flare orbs in 'Orb Update'. The orb-like lens flares shown here are caused by the sun shining in the camera lens. They are given weight as possible supernatural occurrences by cropping up in a cemetery, but the flare orbs are purely a result of the image of the sun internally reflecting in the camera lens and rendering out of focus as a Circle of Confusion on the digital sensor - see explanation of orbs. The colour of the flare orb is most likely to come from the microscopic lens coatings which are used to minimise flare. Flare colours range across the visible light spectrum, and the colour of the light source may also be relevant. This photo was taken by a student on one of our Photospace photography courses. The brown out-of-focus foreground object is the top of a metal junction box. 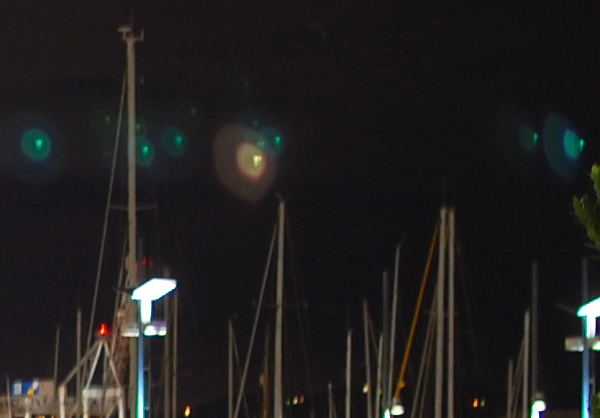 There was no visible phenomenon in the sky, and the row of lights above the boats appears in an area of sky; there is no hillside with lights in this area. Camera data: Nikon D40, 35mm f1.8 lens, shot at f2.5, 1.3 seconds, 200 ISO, no flash, 3008x2000 pixel JPEG. Taken: 6.50pm, 29/6/09, Wellington waterfront near Te Papa, showing the marina on right. 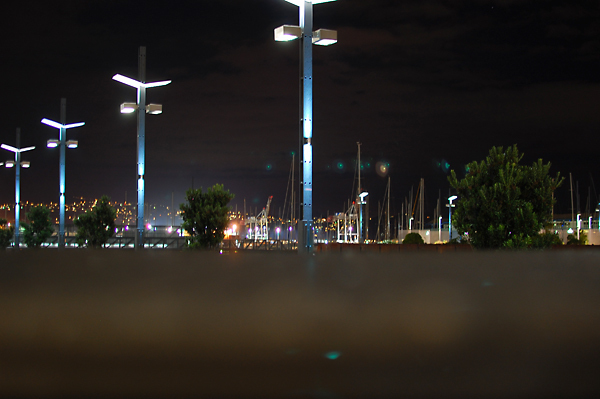 We think that the anomalous lights in the sky are actually reflections of the bright white lamps on the posts. 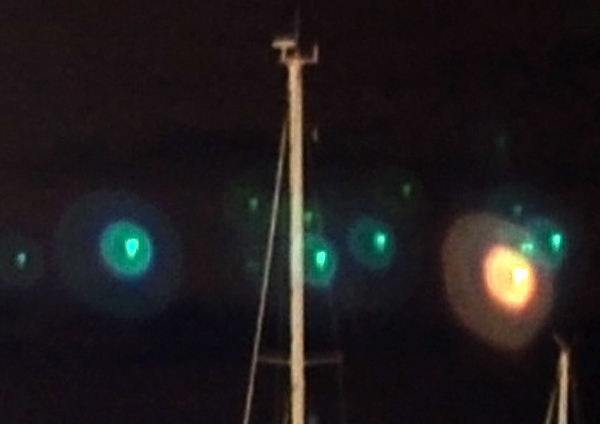 They have been reflected internally in the camera lens, picking up a blue-green colour from the lens surface coatings, and have been captured by the digital sensor as secondary reflections from the lens. The similar effect on the top of the junction box, foreground, (see top photo) reinforces this. As above but brightened using Levels in Photoshop and further sharpened. This reveals the concentric structure of the flare patterns. Note: this is a distinct type of lens flare that we don't yet have a special name for. The secondary image is always a translation of the original light source, reflected directly through the centre of the photo. That is to say, a light in the upper left of the photo will have its secondary image appear in the lower right, and you can draw a line through the centre of the photo connecting the two. Each occurs at the same distance from the centre. Suggestions for a special name are welcome.